With modernist styles coming into greater popularity, many people are starting to notice the trend of stark offices spaces. Office managers and designers are constantly looking to strike the right balance between a work space that is pleasant but also one that helps maximize productivity. As such, offices in recent years have become uncluttered, minimalist spaces in the hope that they will lead to happier and more productive employees. However, interestingly enough, studies have shown that quite the opposite is true. In fact, stark and minimalist spaces can be a very toxic work environment, whereas the right plants can help improve your office space. So what is actually beneficial in terms of decor in the workplace? There is significant research nowadays that shows adding plants and lush greenery to office spaces help improve morale productivity. Why Are Plants So Beneficial? The “lean office” mentality, developed primarily during the Industrial Revolution by Frederick Winslow Taylor, originally appealed to office managers’ bottom lines. It was thought that having simple clean spaces in large spaces allowed businesses to easily add additional workers and keep costs per employee quite low. It also made logical sense, as fewer personal items were thought to help increase productivity. Unfortunately, despite the prevalence of Taylorism (as it is now commonly known), there has been little evidence to back up its productivity claims. Instead, most studies find that employees in stark office environments are less happy and efficient in performing their job tasks. The lean office is likened to placing a lion in a cage with no greenery or natural habitat to provide comfort. People become just as restless and unhappy as the animal would in that situation. However, in studies where every office worker could see a plant, the employees were found to have better overall morale. Aside from the obvious aesthetic benefits and the calming nature of being surrounded by greenery, there are actual health benefits that people gain from being surrounded by plants. First of all, they help to increase the overall humidity of the space. Office spaces tend to be very dry because of the climate-controlling systems, but for optimal comfort, humans need 40 percent to 60 percent air humidity. Plants help to regulate this. Many plants also act as air purifiers, removing toxic elements that enter the space from A/C and heating units, such as formaldehyde, benzene and nitrogen dioxide. They have also been shown to reduce airborne dust, minimize background noise and regulate the air temperature, providing an overall more enjoyable and healthy work environment. The other wonderful aspect of adding plants to an office environment is that they are a relatively low-cost way to enhance the office space that doesn’t interfere with workplace tasks. There are also plenty of firms and services to help you decide which plants to buy and how to arrange them in the space, which helps you take the guess work out of the equation. In addition to health and productivity benefits, plants can also be used to solve practical problems. Placing them in strategic places where garbage tends to collect can prevent the build up of clutter around the office. There are certain plants that thrive better indoors and also provide the most benefits. 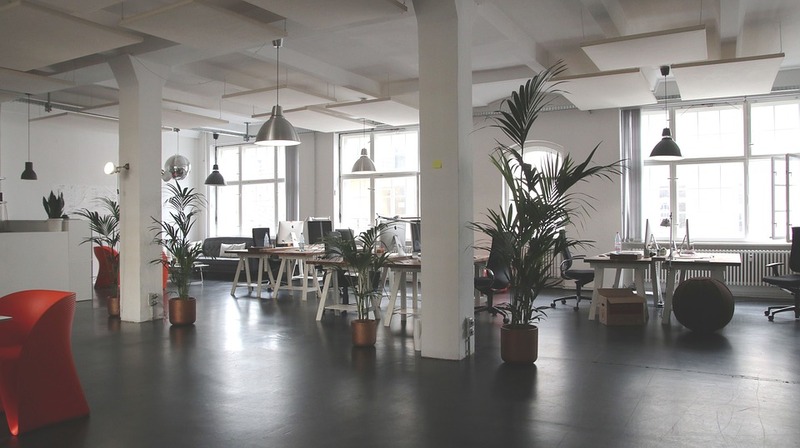 However, the particular plants that are best for you will depend on your office space. Plants that are great for absorbing high-frequency sound, which is shown to be the most irritating and distracting to office workers, include the peace lily, sweetheart plant and Madagascar dragon tree. Mother’s-in-law tongue are great plants for absorbing toxins in the air, and also can be quite large plants that are useful for decorating bigger spaces. Plants can also be a very useful way to decorate hospitality spaces, such as hotels and restaurants. They give these spaces a lush, comforting vibe that is appealing to guests. They can make anywhere feel more luxurious. And, because plants are useful at calming nerves and reducing stress, they help guests relax. For additional help and support, utilize Texas Tropical‘s services to help you design the perfect indoor plant design and care for your office space.